Tonight we;re in a grove between caragana hedges, on the Duke farm near Eastend SK. Now that the dark has descended, it feels like a secret, hidden place, with only the sound of cicadas and crickets to accompany my typing. No coyotes as yet, although the moon is full and just waiting for their chorus. The farm is located along the Frenchman River, with the steep walls of the valley rising miles away at either side of a great, wide, flood plain. We walked that plain all day….tawny hills on the left and the right, white mud cliffs that leave your fingers stained, and a river I wanted several times to jump into for some kind of break from the heat. For the first time this trip, we’ve had to contend with mosquitoes, so setting up tents was a hurried affair. Fortunately, we have a gazebo, and that’s where I shelter to write this. The others have gone to sleep – funny how a full day of walking makes for fatigue as soon as the sun sets. For a late supper we put together Madonna’s lentil soup, Hugh’s beans, Kathryn’s broccoli salad and some British Army ration soup. We ate the resulting mix, out of the pot, with gusto. 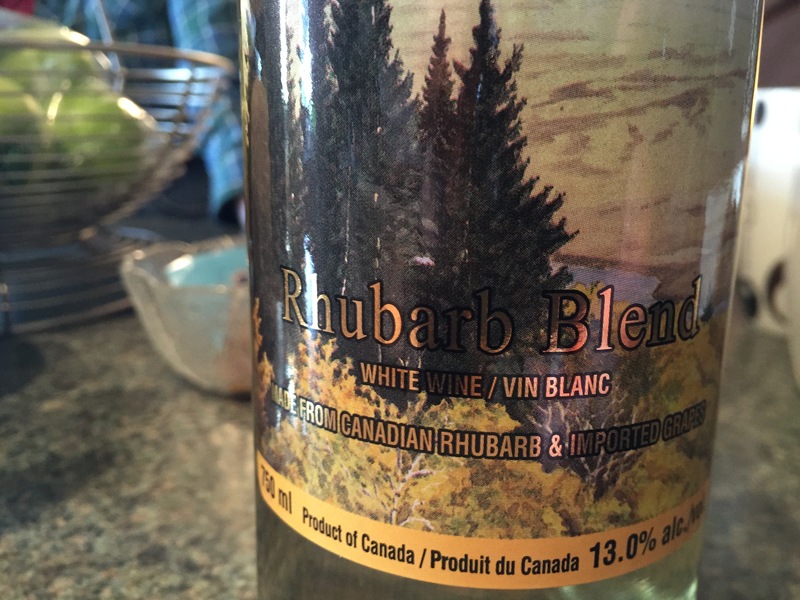 But the best part of the meal was rhubarb white wine, from the Cypress Hills winery, donated to us by Curt and Lorie Gronhovd, the incredibly kind hosts with whom we stayed last night. 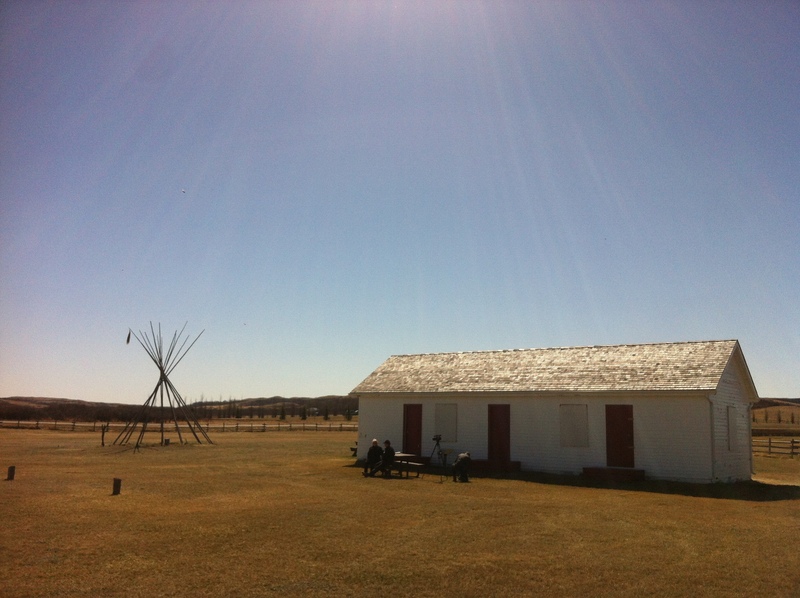 Over dinner (and the wine) we talked about saints and First Nations, about the connection between the Egyptian desert fathers and the Irish monks, and between those monastics and a pilgrimage here and now in south-west Saskatchewan. I guess it’s no mistake that this is, also, a semi-desert that we walk through. Fifteen miles today in land that, like the Biblical wildernesses, reduces the walker to the essentials. 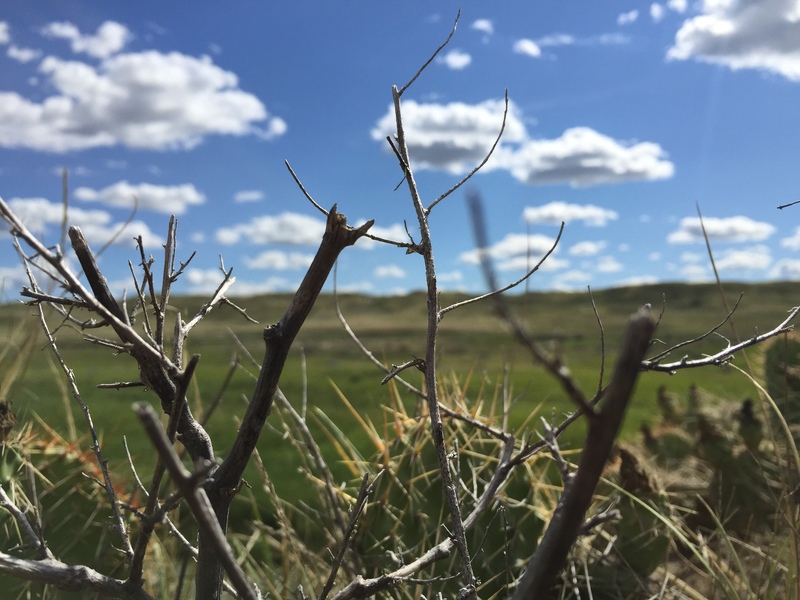 When the land is so sparse and the cactus and short grasses (and some cattle skeletons) are all you see, the wind blows and I think of Ezekial calling the four winds at the Lord’s behest, or Christ in the desert. Or Saint-Anthony, seeking white martyrdom in the wilds of Egypt. Tomorrow we walk to Chimney Coulee, so named for the chimneys left behind by the Métis hivernants who built a settlement there in the mid 1870s. They say there are ghosts there, of the Assiniboine who died scavenging after Cowlie, the Hudson’s Bay trader, hurriedly left in 1873. I guess we’ll find out tomorrow night. For tonight there’s the moon, the mosquitoes, the dark, and the wind through the caraganas. And thoughts of the saints and their time of testing and of encountering the divine in a wilderness not so different from this one. There’s something exciting and exhilarating about taking shelter in the back of a van, the back gate up providing a temporary roof, watching the driving rain come down so hard you don’t dare step out into it. It feels just a bit precarious when the lightning is so loud and close you take your feet off the ground just in case there’s a nearby strike. Wondering if the tent you’ve set up under the caraganas will hold up and stay dry (especially since your sleeping bag is already in the tent. You can see the fabric of the fly bouncing from the weight of the downpour, the heavy rain spraying from the roof). But it’s also, somehow, comforting. You are – mostly – dry, the threatened wetness in your boots and the moisture seeping down your back balanced by the carrot and coriander soup mixed with long grain rice (British Army rations) that you’ve saved from the fire and are now eating, steaming hot, straight from the pot. I’m alive and well. Both. I’m learning once again that the two are not always the same thing. 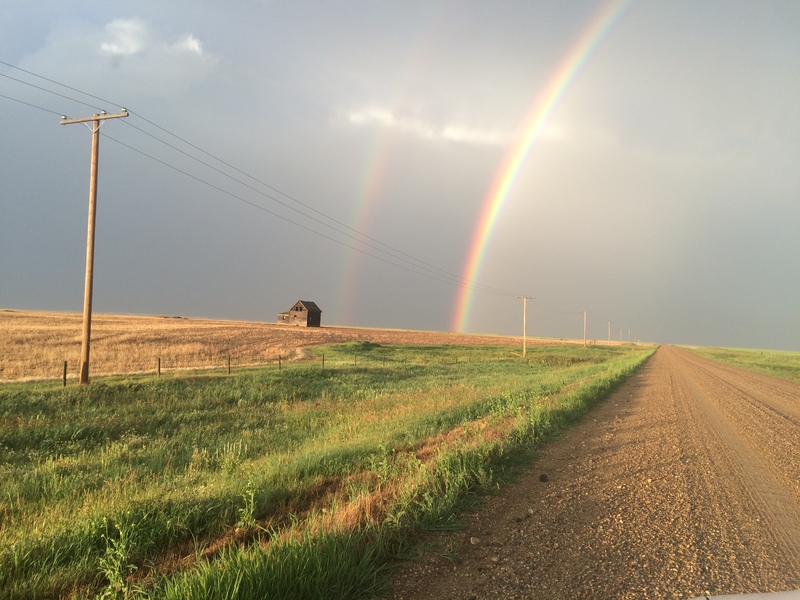 After the rain, a rainbow comes out over the Frenchman River valley, also known as Whitemud. The valley is so wide you can see both sides of the arc touching down. Golden light floods the river plain from the west. There are horses – perhaps a dozen – charging around the field beside us, kicking up their back legs, perhaps in relief at the temporary respite from the storm. It’s one of the most beautiful sights I’ve ever seen, their manes and tails flying against the dark sky. The clouds close again and the rain settles in – 7/10ths by morning. I’m awakened several times by flashes of light and loud booms, and sometimes by the horses in the Green’s trailer, whose movements also sound like thunder. At 6:45 am Hugh and I meet in our rain ponchos in the drizzle, trying to decide what to do. Bishop Don’s tent has flooded. The horse folks are calling it a day before starting and starting to pack up. It will be impossible to get through the riverbank grass and lower bogs in any case, so we decide to postpone the half-day river section of the walk. We confer with the rancher, Terry Jensen, a cowboy so stoic he looks as though he would be unperturbed if a spaceship landed on his property. He owns as it might be good to wait. We drive up and out of the valley before the road becomes impassable. It’s the first day we’ve had to change plans. Flexibility, I tell myself, is one of the marks of a pilgrim. 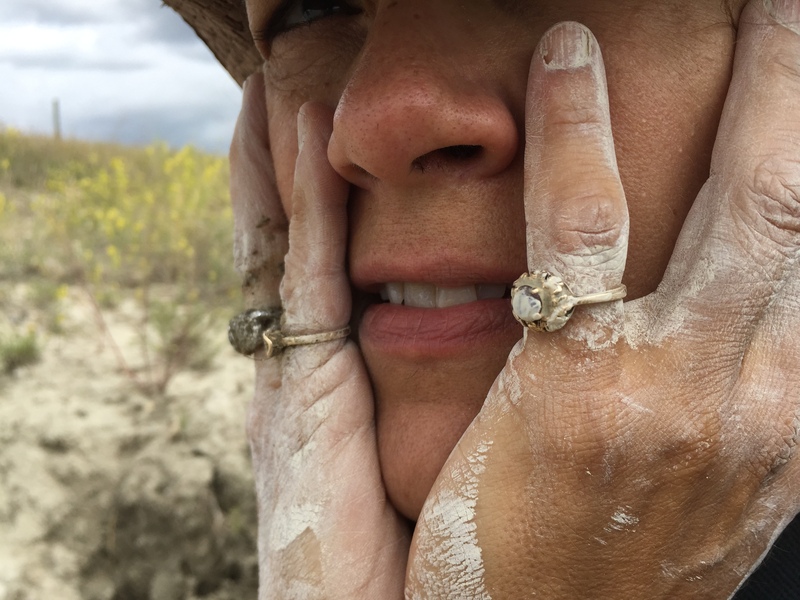 There’s a whole vocabulary that I’m learning on this pilgrimage – a language that maybe I should have learned when I lived here, but never did. Lots of farmers and ranchers know this language. Hugh knows it. It’s the vocabulary of place, of the creatures and growing things on this tawny plain. I have a beginner’s knowledge. 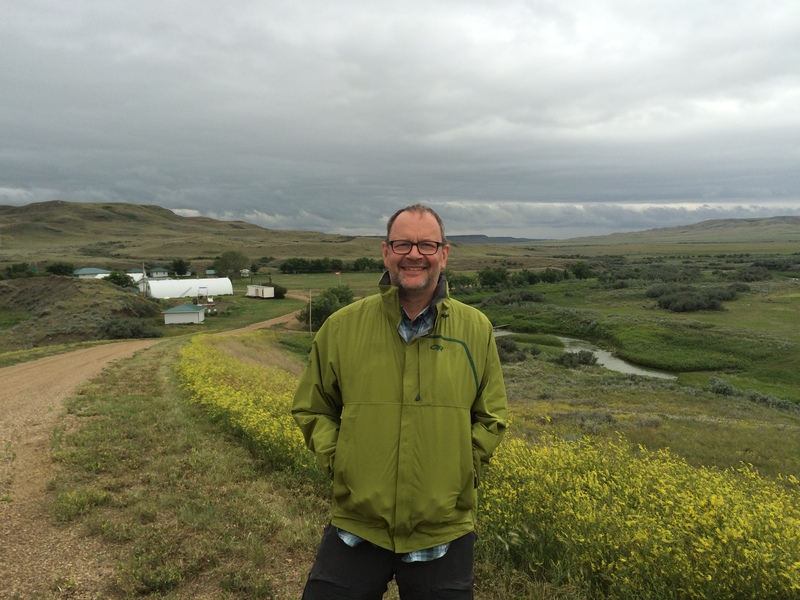 I know words like meadowlark and magpie, speargrass and mule deer. But there’s so much more to know. Lark bunting. Buck brush. Short-horned lizard. Swainson’s hawk. The various geographical formations. Any of the myriad of songbirds that fly up as we approach. Trevor Herriot read from his book at our Val Marie event tonight. We had a great crowd, including friends who drove down all the way from Saskatoon to be there. Trevor emphasized that growing to love something is learning the words that describe its complexity and colour. It’s just natural to give words to what we respect and care for. Yesterday two of our group of four pilgrims ended their leg of the walk. Rick Kotowich will be staying for the community event tonight in Val Marie, and then heading home, perhaps to join us again near the end of the pilgrimage. My former teaching assistant, Hayden Thomassin, managed to find a spot on the Greyhound to Regina and is in place for his flight home today. Already well over 100 km traversed. 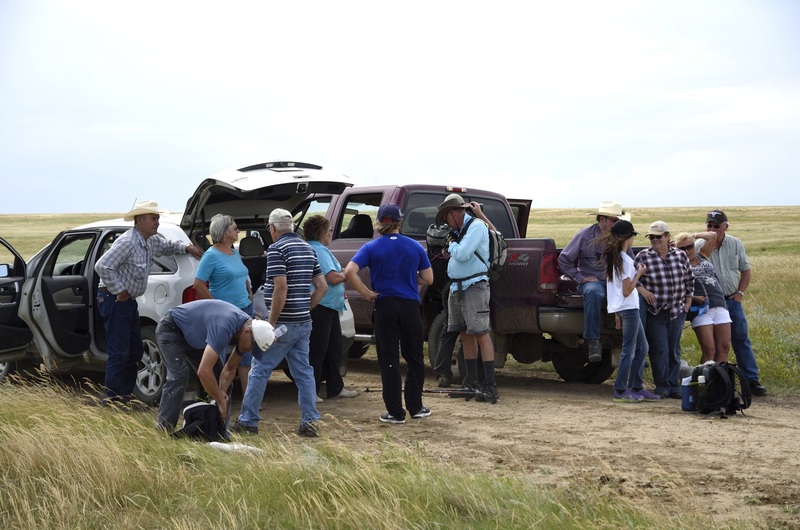 We’ve met some very nice people – in the photo above, three local ranch families (thanks esp to Keith and Margaret Walker and to Howard and Fern Hanson!) came together to meet us as we passed one of the few roads that day. They brought watermelon, rhubarb cake, and cold water, and lots of smiles. We needed the break and the refreshment. 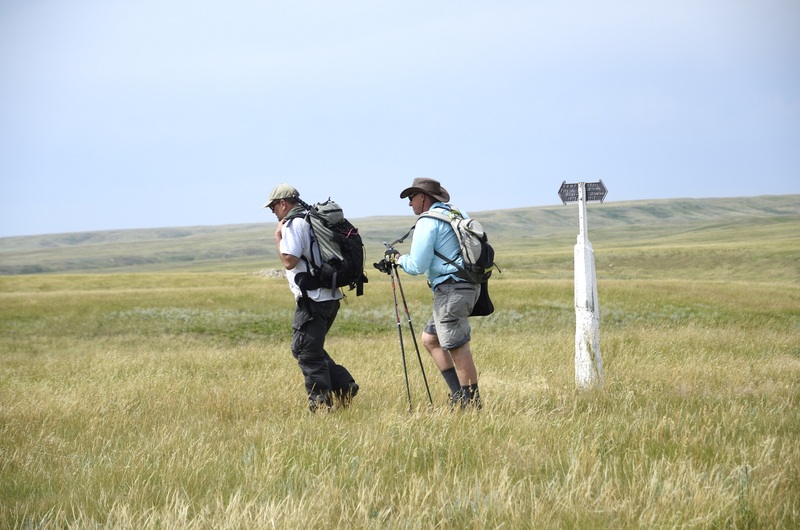 It was perhaps our hardest walking – through mile after mile of natural prairie grassland, over cactus and dry bog and sage and speargrass. By the end of the walk, our laces were furry with the speargrass that worked its way into my shoes and caused a painful blister. Our companions on this portion of the walk were Dave and Esther Green on horseback. We also came across all kinds of wildlife: deer, antelope, coyote, Swainson’s hawks with their scratchy cries overhead, and the tail end of a small horned lizard skittering down a hole. None of the rattlesnakes that live in these hills, unfortunately (or fortunately!). At the end of the day I stumbled across a huge solitary boulder, rubbed smooth over years by the bison herds now gone. When my companions went to see it, they said: “didn’t you see? It wasn’t a boulder but a sleeping buffalo”. Sure enough, it was in the shape of a sleeping bison. Yet another of the magical places that sit alone on this land. Hugh and I will miss Hayden and Rick. Rick’s attention to the spirit and the feeling of the land was inspirational, and Hayden brought a wonderful openness and enthusiasm to this first experience. More pilgrims are joining us today, so the company will change. But the journey, and the land, will stay the same. 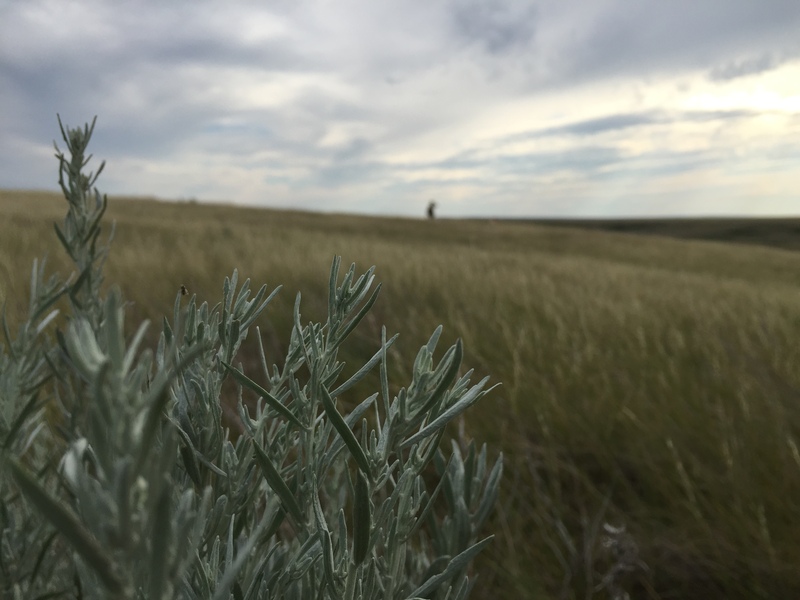 It would be presumptuous to say that we’ve learned how to listen to the land on this prairie pilgrimage. Some – Hugh for instance – already know the flora and fauna very well, and Rick from his Metis and First Nations background has a sense for how the ever-changing terrain contains messages and directions, and listens intently for them. 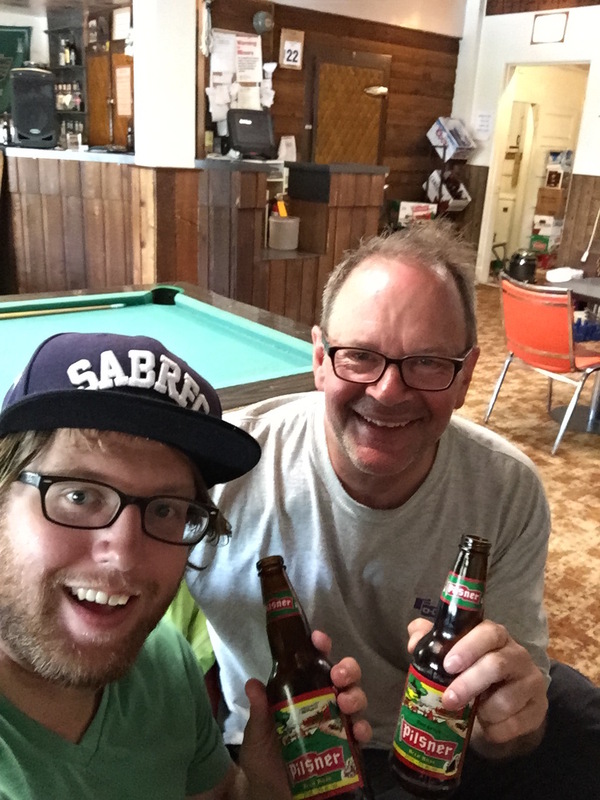 Hayden has the stamina and openness of youth, and the local people gravitate naturally to his enthusiasm. Me? I’m not sure. I’m listening, but not yet sure what I’m listening for, exactly. The barmaid/waitress/innkeeper at our first hotel stop last night is from Australia, near Brisbane. In talking with her we spoke about walkabouts, and it came up again this morning as Rick talked about his trip to central Australia some years ago and his contacts there. I guess in some ways this is a prairie walkabout. Or if not a walkabout, then perhaps what the Lakota elder who smudged us the first day called it in Lakota. I cannot remember the term, but he described us as taking a voyage as they once did, where a group of people simply pack up and leave the safety of the camp to go out and explore. He said it was a good thing to do, and smiled at us. And so we walk, and listen. Yesterday, as the wind abated, we heard so many different bird calls – the eagle, the killdeer, the lark bunting, the meadowlark. The cattle were speaking to us at times, not always happily. And the wind, as it changed, and moved over the terrain, was always new. A pilgrimage, among other things, is a journey of transformation. Yesterday as we started out Rick started humming some old classic rock tune. Then another came up. Then Hayden sang the first few lines of “Take a Walk on the Wild Side”. I guess this is a bit of a prairie wild-side walk, but the transformations in our case are quite different from the classic song! They say there might be some rough weather today. Should be an interesting time of listening. This morning I awoke to such a heavy dew on the tent that it took almost 45 minutes in the morning sun to clear the tent of moisture. But that was the last time in the day that too much moisture was a problem. We set out and about an hour into the walking realized what was different: for the first time in three days we were not walking into a stiff westerly breeze. The last two days, it’s been difficult even to hear one another over the constant, buffeting, hot wind. I borrowed some earplugs from a local SK author at our community event, just so I could keep my ears from ringing in the wind. So, of course, today there was almost no wind. By the afternoon we were praying for even just a slight breeze to cool us off. The lark buntings and kildeers were prancing up and down ahead of us on the dirt road, and in the mud we could see tracks of coyote and deer. 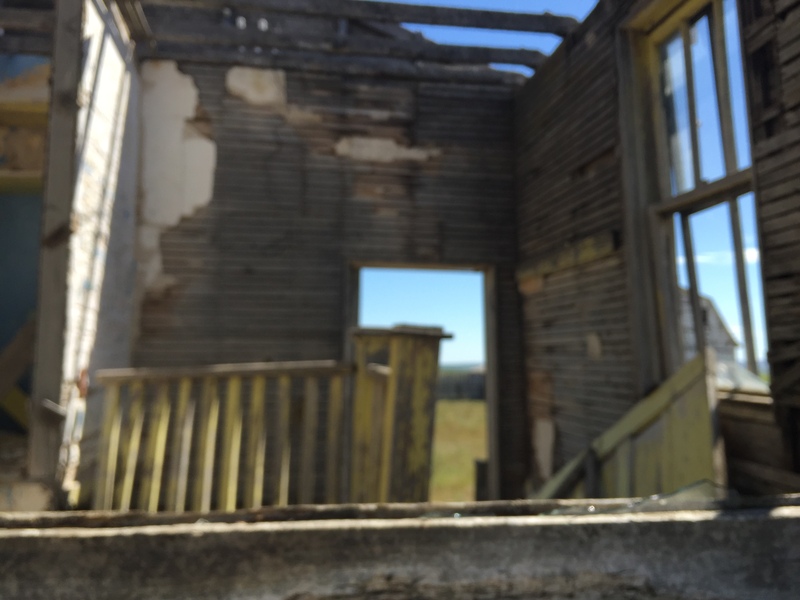 We stopped in an abandoned farmhouse, chasing the reluctant cattle away so we could find the only shade for miles, where I conducted a phone interview with a Saskatoon Talk Show, the John Gormley show. The wind had been active there too, bleaching boards and wearing away at the lathe and plaster walls. The four of us walkers peered through the windows, and tried to decipher the clues that might tell the history of who had lived there, what they liked, their thoughts and dreams, and why they left.